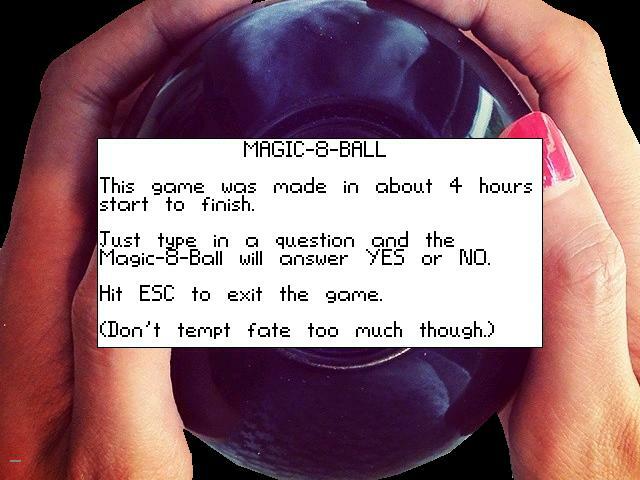 Ask the Magic-8-Ball any YES or NO question and it will reply. This is a game I made in pretty much exactly 4 hours start to finish right at the deadline for the May 2017 MAGS contest. It is brief and rough, but I think I told the brief and rough story that I aimed for. Comment if you enjoyed, or even if you didn't... And don't forget to vote in the MAGS thread in the Competitions forum after playing all entries. Nice! Congrats on releasing one! can a machine that only knows 1 or 0 really simulate real randomness? Yeah, well spotted. My original online nick back in 1999 or so was Mandlebrot (misspelled) which I shortened. I played the game, and I must say, the ending was a fun and unexpected twist! Heh, thanks. I was wondering if anyone had actually found the ending or not. Did you notice that the question you were typing was different to the one appearing on the screen straight away, or did it take some time? I was curious about this as some people look at the keyboard while typing and I was wondering if this would cause them to not notice. I do look down at the keyboard while typing, but I also look up to check for spelling errors... besides I noticed that it wasn't typing what I was typing, when the spaces didn't match. I did find it out almost at once. However, it was a very unexpected turn, and quite amusing too. Well done on getting it all complete again. look forward to seeing what you do on your next release, keep it up! Thanks though either way for playing this brief game and the feedback you gave! Getting anything done in 4 hours is a pretty good achievement, good practice for working under pressure too! (The example tests are no longer online though), anyway I often thought of developing this idea a bit more and perhaps I will in the near future. I am sort of in the middle of a couple of projects that I hope will have me busy for the next while but If I ever do come back to this idea I might hit you up to see if you want to get involved in anyway, after all its not every day you come across a fractal AND p+c fan and its certainly not everyday you see a game based on fractals. I'll PM you a link to my 3d(3d)/2d fractal galleries, though I have not done much with them in a couple of years now. thought you might like to see anyhow. I didn't comment here yet! It seems you have a knack for last-minute releases. I don't look at my keyboard when writing, so I think I noticed right away that something was going not as expected! Thanks guys for the new posts here! @Tycho: Dude! Your work with 3D fractals is breathtaking! I can totally see a game with them as backgrounds and would want to be a part of it! Well done Mandle! I just played this and thought it was cleverly done, good use of sounds too.